If getting the most bang for your buck is more important than the name affixed to your next car's trunk, the 2009 Hyundai Azera is for you. It offers a spacious ride with high-end amenities at a fair price and is a family-friendly sedan with performance and style. It is a luxury vehicle with lots of room. I have had my vehicle for over three years and it is really reliable. I haven't had any major issues. Oil changes cost more due to the size and type of filter required. It gets pretty good gas mileage. Only issue was when I needed new tires and I found out this came with a rare size that was quite expensive. They were able to swap it out for a similar size that was more affordable and I never noticed the difference. I had to replace the battery twice which was odd but not the cars problem. I needed a new engine and chassis, it is split and cost nearly $3000. I feel comfortable in the car, enjoy it. I have had it a long time and plan to continue. I have nearly 88, 000 miles, I think it does well on the road. Only one major problem in owning for eight years. I love all the bells and whistles on my car. Even though it's almost 10 years old, it still runs like a dream. I wish it got better gas mileage and that it wasn't so expensive to repair. 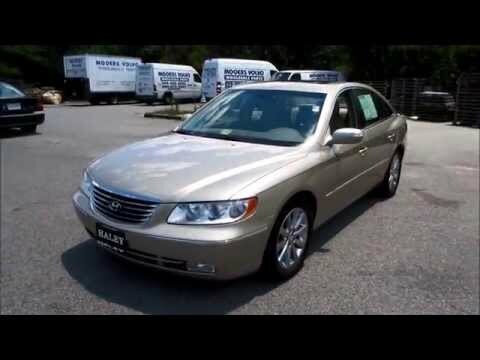 HYUNDAI DE PUERTO RICO IS RECALLING CERTAIN MODEL YEAR 2006 THROUGH 2009 AZERA VEHICLES MANUFACTURED FROM SEPTEMBER 27, 2005, THROUGH OCTOBER 1, 2008. THE WIRING HARNESS FOR THE RIGHT FRONT SEAT BELT TENSION SENSOR MAY SUSTAIN DAMAGE AFTER REPEATED USE OF THE SEAT BELT. IF THE SEAT BELT TENSION SENSOR WIRING BECOMES DAMAGED THE AIR BAG WILL NOT DEPLOY IN THE EVENT OF A CRASH NECESSITATING FRONT AIR BAG DEPLOYMENT. HYUNDAI WILL INSPECT AND REPLACE THE RIGHT FRONT SEAT BELT AND INSTALL A NEW SEAT BELT TENSION SENSOR WIRING HARNESS CLIP, IF NECESSARY, AND REROUTE THE RIGHT FRONT SEAT BELT TENSION SENSOR WIRING AND SECURE THE WIRING WITH A NEW HARNESS. THIS SERVICE WILL BE PERFORMED FREE OF CHARGE. THE SAFETY RECALL IS EXPECTED TO BEGIN DURING JANUARY 2010. OWNERS MAY CONTACT HYUNDAI DE PUERTO RICO 787-999-3333.